AKDY 21 Bottle Dual Zone Thermoelectric Freestanding Wine Cooler (March 2019) Review! 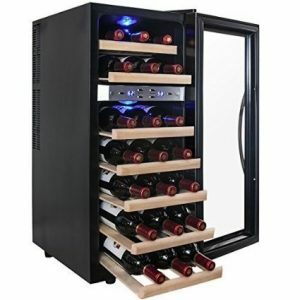 AKDY WC0021 is 21 Bottle Dual Zone Freestanding wine cooler. You can store up to 21 standard 750ml bottles into it at a time. If you have larger bottles for champagne/sparkling water then you’ll need to remove one shelf to adjust it. This is standard procedure in all the wine coolers. The shelves are made of wood. You have top two shelves for your white wines and rest for the red wines. There are total 7 shelves, and you can place 3 bottle in one shelf. The upper zone has temperature range of 44°F-66°F and the lower zone has temperature range of 50°F-66°F. It is highly efficient and consumes low energy compared to other wine cellars. The thermal electricity allows it to reduce the noise to lowest extent possible and there are no vibrations since it doesn’t use traditional motors. On the exterior part we have touchpad for adjusting the temperatures of both the zones. When you start first time they’re set at 50F/50F for both. The blue LED lighting in the interior makes it look really cool from the outside. The customer service is amazing and this product comes with 1 year manufacturers warranty on the parts. The setup is very simple and straightforward, some customers have submitted reports of getting damaged shipment but the company has been very kind enough to replace those shipments immediately. You can read detailed customer review for AKDY WC0021 from Amazon.com here. You can also compare this with Haier 18-Bottle Dual Zone which is also in same range as this one. Or you can look at some of the single zone wine coolers like NewAir AW-181E 18 Bottle Thermoelectric Wine Cooler or Haier 6-Bottle Wine Cellar. We’ve compiled a list of best wine coolers/wine fridges right here, take a look and let us know what you think about our list.